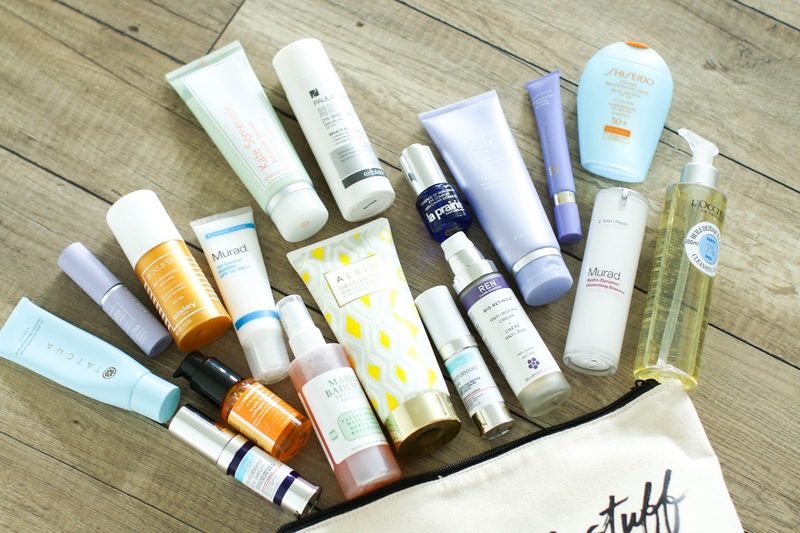 I brought a ton of products with me on my road trip, so I thought it would be a fun to show you a peek inside my skincare bag. I also linked all my makeup products that I brought with me in the widget at the end of the post! 1. Tatcha Pore Perfecting Sunscreen - I love this sunscreen as a makeup primer. It helps to minimize the appearance of my pores, mattify my skin and my foundation glides effortlessly over it. 2. Kate Somerville Goat Milk Eye Balm - I had trouble sleeping many times during the trip because being in a new bed every few days can make me restless. As a result, I woke up with puffy eyes many mornings and this soothing, comforting and intensely hydrating eye balm was the first thing I would reach for. Sometimes even before I washed my face, I would swipe this under my eyes to soothe them and then go grab some breakfast. It is an absolutely brilliant product with a gorgeous texture. 3. Sisley Sunleya Age Minimizing Sunscreen - On days that I wanted a bit more sun protection, I would always reach for this. 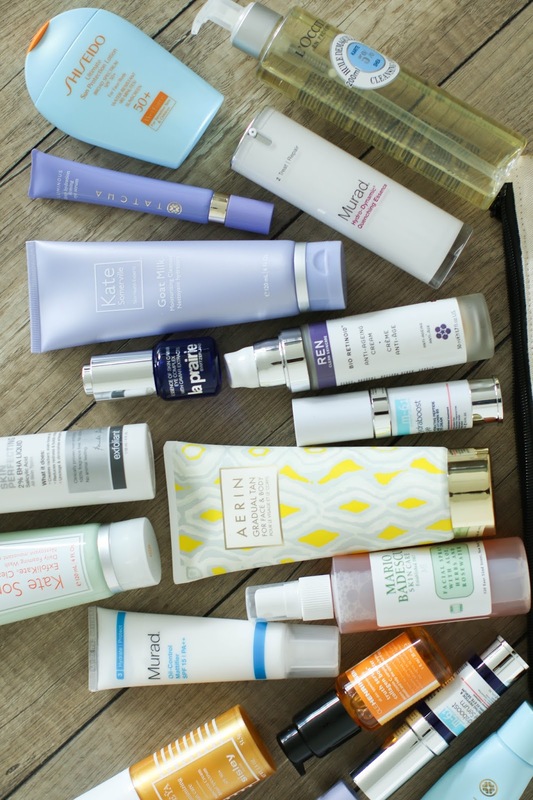 It is an SPF 50 and is probably one of my favorite sunscreens in my whole collection. It feels like a hydrating moisturizer rather than a greasy sunscreen, and leaves my skin with a natural finish. 4. m-61 Hydraboost Eye Serum - I ended up using this eye serum a ton during my trip because it is so hydrating and lightweight. It absorbs immediately and worked well for both morning and night. I could see an immediate difference in how smooth and taut my skin looked after applying. 5. Ole Henriksen Truth Serum - I have been using this serum for years and it is still a staple in my collection. It absorbs easily, hydrates, brightens and never makes me break out. I can always guarantee that my skin will consistently look great when using this serum. 6. Mario Badescu Facial Spray - Not only is this intensely hydrating, but it calms my skin instantly. 7. Aerin Gradual Tan For Face & Body - I am not a fan of self-tanners typically, but this is so slight and gradual that it works wonders for my pale skin. I added it to my legs each day to give them a healthy look. 8. m-61 Hydraboost Eye Cream - I usually paired this with the serum when I needed a bit more hydration under my eyes. Especially at night I felt quite dehydrated after being in the sun all day and this was a welcome comfort for my under eye area. It immediately smooths out any fine lines and soothes the area. 9. Murad Hydro-Dynamic Essence - I usually reached for my Mario Badescu spray most days, but there were a few times that my skin felt extra dry so I would add this after the MB spray to give a more intense boost of hydration. 10. Kate Somerville Exfolikate Cleanser - When I wanted a slight exfoliation, I would use this as my second cleanse. 11. Murad Oil Control Mattifier - This has been my holy grail mattifying primer for years. On days that it was super humid, I would pull this out and wear it under my makeup. I can usually get a full 8-10 hours of matte skin with this on. For an added layer, I dust this powder over my skin to really help lock in my makeup for all day wear. 12. La Prairie Essence of Skin Caviar Eye Complex - This was my favorite eye serum to use most mornings. It has an immediate tightening effect, absorbs instantly, hydrates and smooths out any fine lines. And concealer applies flawlessly over top. 13. Ren Bio-Retinoid Cream - I don't ever leave home for a trip without this cream. It does wonders on my breakouts and I often use it as a spot treatment when a blemish rears its ugly head. 14. Tatcha Deep Hydration Eye Serum - I realized that I brought an abundance of eye creams and serums, so I didn't end up using this much. Typically I love it as a hydrating serum either alone or under a richer eye cream. 15. L'Occitane Shea Cleansing Oil - One of my favorite cleansing oils ever. It removes every last stitch of makeup effortlessly. 16. Kate Somerville Goat Milk Cleanser - The rich balm texture of this cleanser made it perfect as a second cleanse. I could use this to remove makeup, but I preferred to rub it in and let it sit on my skin for 2-3 minutes as a treatment. My skin felt soft, supple and hydrated after removing it with a wash cloth. 17. Sunday Riley Tidal Moisturizer - This moisturizer is like a shot of water for my skin. Since I was out in the sun almost every single day, I would pile this on at night to help replenish my skin. 18. Paula's Choice Skin Perfecting Liquid - I didn't use this every night, but when I had a breakout - I would put this on a cotton pad and swipe all over my face. After I would follow up with the MB facial spray, serum and moisturizer. 19. Shiseido Ultimate Sun Protection Lotion - I typically would reach for my Sisley sunscreen most days, but I would occasionally use this SPF as well. It gives me high sun protection, and leaves my skin matte and smooth. I also brought this sunscreen with me which I enjoy because it has a slight tint to it (full review on it here). 20. Pixi Glow Tonic - This is one of my top 3 favorite exfoliating toners. I use it morning and night after I cleanse, and before I apply the rest of my routine. A few times during my trip, I would use these pads instead for a stronger exfoliation and I swear my skin looked so even and perfect the next morning! Hi Maree! Do you ever find that your moisturizer and/or foundation ball up or "pill" a little after using the OH Truth Serum? I love the way it makes my skin look but I've found it can cause other products to ball up on top. I actually don't which is why I love it so much. However, I do use a small amount so maybe that is the trick!